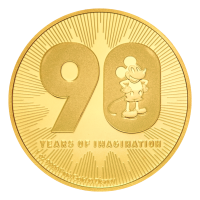 90° Aniversario Disney Mickey Mouse | Moneda de oro 2018 de 1 oz We’ll offer you the web’s lowest rates when you make your 1 oz 2018 Disney Mickey Mouse 90th Anniversary gold coin, from our store online now. This brand new release in conjunction with the lovely island of Nieu, about 2755 miles off New Zealand, celebrate’s Mickey Mouse on his 90th anniversary. The reverse of this stunner bears the number 90 in prominent numerals, with an image of a truly classic looking Mickey, the mega famous Mouse, standing in the zero. The 90 is set on a 16 pointed star design, with the rear field in radial, micro-engraved line texturing; the reverse, which also features the weight, metal content and denominational value, also features the words: Years of Imagination, below the anniversary numerals. The obverse field, which is without the reverse’s unique partly textured field detailing, is home to a meticulous portrait of Elizabeth II, wearing her Girls of Great Britain tiara. Elizabeth II’s name is also on the obverse, as is the name Niue, the impressive, $250 face value, as well as with the coin’s year of issue. New Zealand Mint has partnered with Disney, whose founding creative mind and cartoonist, Walter, designed the character in 1928, to bring you this licensed, sovereign coin. A perfect gift for lovers of all things Disney and a surefire collectible, marking, as it does, the lively mouse’s 90th birthday anniversary… fortify your holdings with a 1 oz 2018 Disney Mickey Mouse 90th Anniversary coin.